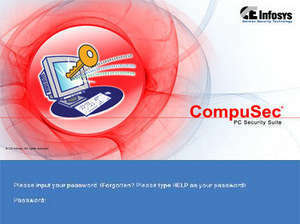 FREE Compusec 5 is a powerful, yet free, security solution for desktops, notebooks and tablet PCs. It comes with a lot of features, such as pre-boot authentication, hard-disk encryption, encryption of files and folders, encryption of removable media and others. One of the compulsory components it will install is the pre-boot authentication. This will prompt for a user ID and a password, before the operating system can be booted. Version 5.3 is a freeware program which does not have restrictions and it's free so it doesn't cost anything. For security reasons, you should also check out the CompuSec 64bit Free download at LO4D.com which includes virus and malware tests. Additional screenshots of this application download may be available, too.